Student Lamp Chimney, Sans Rival design, 1.888" base diameter, 10 3/4" tall - Borosilicate glass, made in the USA from a mold made from an original German Sans Rival chimney. $46.95- OUT OF STOCK!!! (Out-of-US delivery requires extra postage required for chimney in sturdy box - $5.00) Limit two chimneys per order/per box to ensure there will be no breakage in transit. 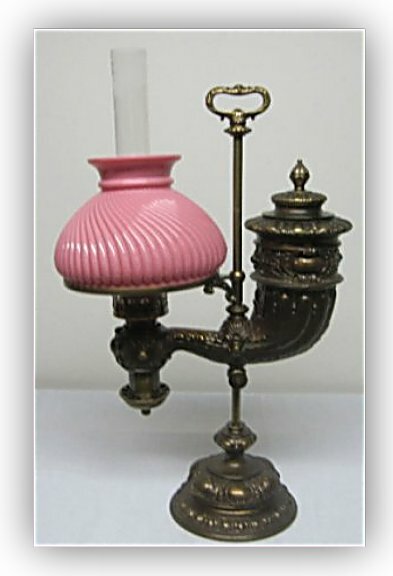 Student lamps using a 3/4" diameter circular wick were in use by 1860. 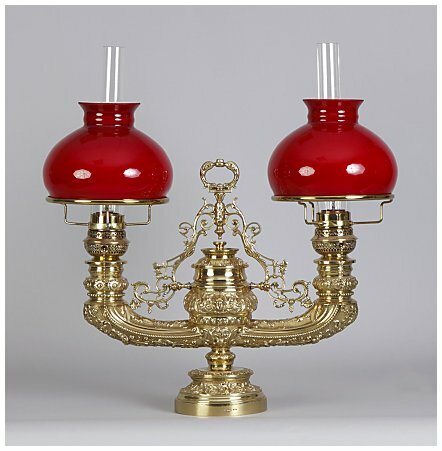 These lamps were of an Argand style, a circular wick without a flame spreader. To obtain a bright light for reading, the flame had to be elongated, raised, to have the highest "flame front" possible. To this end the single-pinch "Kosmos" style chimney was employed. The best student lamp chimney of the Kosmos style was the MacBeth #50. It produced the cleanest burning and brightest light, but that light was still yellow with incomplete combustion - the lamps produced a noticeable aroma. MacBeth #50 chimneys have not been available for many decades. A few of my customers were using the Sans Rival 14''' Kosmos chimney and noted the absolutely superiority of that chimney over any single-pinch standard Kosmos chimney (see the results below), and they wanted a reduced-base Sans Rival for their Student Lamps. I had samples made using the Sans Rival as a guide but using the base dimensions of the MacBeth #50. The results were absolutely outstanding - white light and no aroma even when burning very low as a night light. The production chimneys made with borosilicate glass ("Pyrex") are now in stock. Diameter of first bulge: 1.422"
Diameter middle of draft control constriction: 1.106"
Diameter of secondary bulge: 1.289"
Diameter of chimney above secondary bulge: 1.056"
The draft control constriction is what makes this chimney burn so wonderfully. It pulls up the flame and compresses it to induce complete combustion of the fuel, resulting in an elongated "white light" flame with considerably better brightness and clean burning when compared to a standard student lamp style chimney. It is amazing. Heavy Oil, 0.5" Heinrichs & Knopp, 1.5" Manhattan, 2.125"
Note the indicated fuel levels below the burners above; the fuel flows from the separate font to the small fuel supply around the wick. 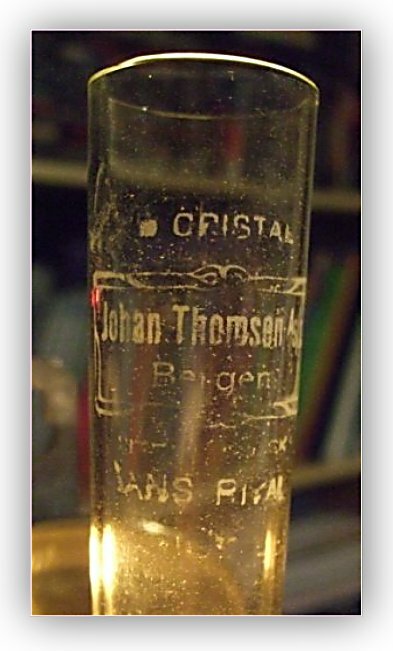 The level of the fuel below the wick can be measured by the height of the top of the fill tube. This system allows the fuel around the wick to be a constant level until the separate font is empty. 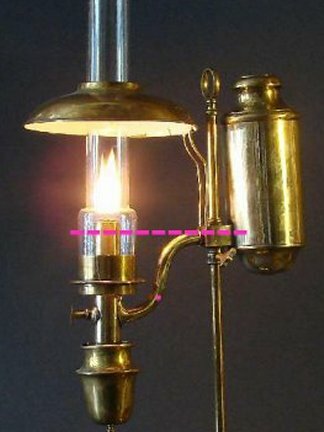 The heavy oil lamp on the left above requires a mineral oil or vegetable oil such as olive oil: the fuel level is far too close to the flame to use kerosene as a fuel. The medium fuel H&K student lamp in the middle photo above requires a blend of mineral or vegetable oil and kerosene as the heat of the flame just 1.5" above the fuel causes kerosene to actually boil and sputter - definitely not safe! The Manhattan Perfection Student Lamp on the right above has the correct fuel level for burning kerosene. 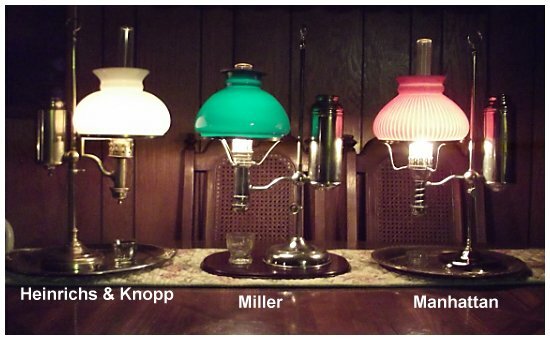 In most cases the wicks are the same on all three types of student lamp. I can make wicks for the No. 11 Postal Student and large and small German Student Lamps upon request. I have used your 1 7/8 prototype Sans Rival chimney on several of my student lamps, including the Berlin that burned "rich" and was very aromatic. All I can say is WOW!!!!!!! The flame could be set from a low night light to the "Christmas tree" height with excellent results. It increased the light output by at least twice. It almost looks like the mantle of an Aladdin lamp. The chimney is as clean as the day I got it with no residue after burning for about 15 hours. I would hope it would be feasible for you to have this chimney put into production as it makes all the difference in the efficiency of the lamp. Please advise if and when you do. By far the most common size Kosmos-style lamp is the 14'''. They were produced in many countries in Europe for over a century. It is therefore no surprise that chimney base diameters varied considerably for what was listed as standard 14''' lamps. The Sans Rival chimney has a base diameter of 2.031". 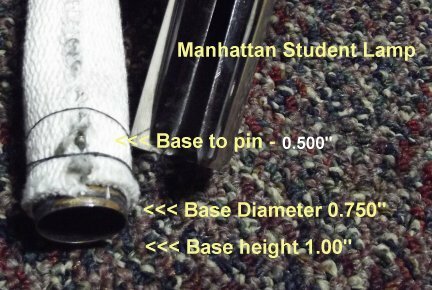 I have other 14''' chimneys which range from 2.00" to 2.109" diameter - about the maximum diameter which will fit the burner. All chimneys get hot in use, and glass expands when hot. There should be spring finger tension to hold the chimney in place so when hot the chimney has room to expand. Never used your fingers to bend chimney prongs - it is far too easy to bend the fingers too far and break them, plus the individual fingers will not be adjusted evenly. If a chimney fits too tightly, gently bend the fingers out from the inside by using the convex side of a teaspoon. To bend chimney fingers in, something about the diameter of an AAA battery can be held horizontally right in the curl of the chimney fingers and moved around the outside of the fingers, gently bending them in to have a uniform spring tension. Start the bending process at the wick raiser knob and end there for uniform concentricity. 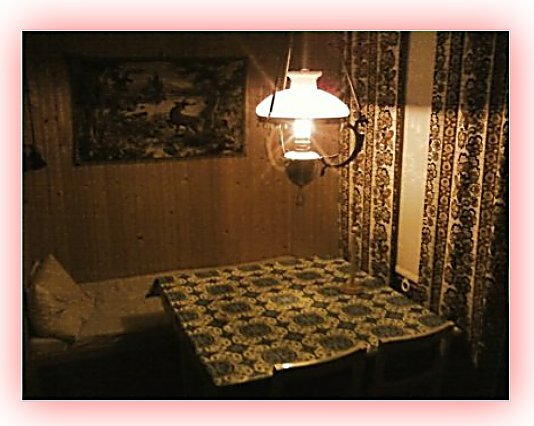 At far right is a photo of the hunting cabin in northern Norway where William Sogge found the original Sans Rival Chimney. And there is the 14''' Kosmos lamp burning brightly in the same place it has hung for a hundred years. Near right photo - the signed original Sans Rival which was used to make the mold for my Sans Rival chimneys. At right is a photo of a typical 14''' Kosmos Concierge. Note the brilliant white light in the "Christmas Tree" effect from the Sans Rival Chimney. 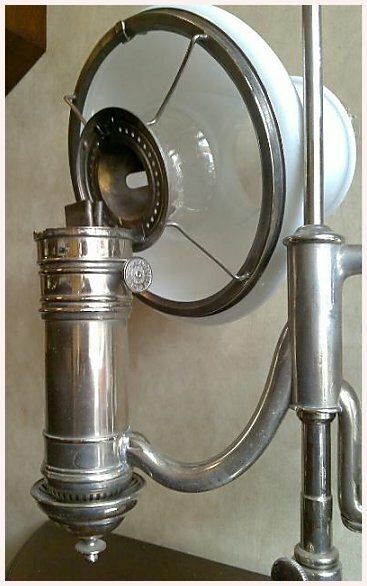 The Sans Rival's enhanced draft and flame control allows for the brightest white light on any 14''' Kosmos lamp. And that wonderful draft control means that even at a very low setting, for example as a night light, the lamp produced clean, odor free burning. So clean, in fact, that the chimney seems to stay clean and without a trace of smudge even after many days of burning. At right is a pretty poor example of a 14''' Kosmos lamp. I purchased this dog almost 20 years ago. There was a pinhole leak in the glass font. Fixed that with radiator epoxy. I fired it up and it smelled horrible. It traveled to a shelf in a storage room and stayed there for all this time. A few days ago I dug it out, straightened the collar so the chimney would be fairly close to vertical, installed a new wick and tried it again. Still smell horrible from a too-rich mixture not be able to fully burn in a conventional Kosmos chimney. I stuck on a Sans Rival chimney and it burns white with absolutely no aroma. The Sans Rival chimney burns hot and the secondary combustion chamber burns up all residual vaporized fuel so there is no aroma when burning the lamp! The visible flame shown in the photo at right is not maximum height. In this test I only had perhaps an inch and a half of fuel in the font. The wick had to raise the fuel over 7" and that is too great a lift to sustain a full burn without an apparent capillary deficiency. If the font was 3/4th full of fuel it would sustain a flame above the secondary combustion chamber in the chimney. But it works! 1-K at the hardware store, but very close. My standard lamp fuel for non-problem lamps. San Rival Chimney, burner turned up until it started to smoke and nudged back to a clean burn. Standard modern 14-line chimney (perhaps B&P or Gaudard) on same lamp. One I consider typical of today's Kosmos chimneys (poor constriction shape). 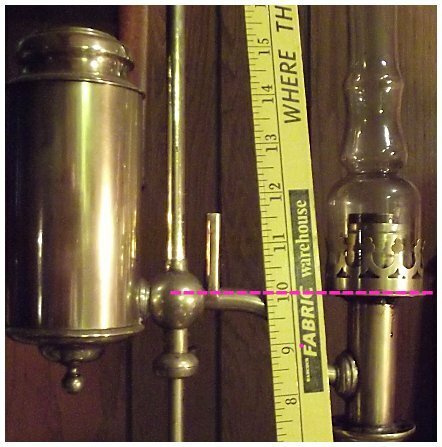 Chimney was about 1/2 inch shorter overall than the San Rival. Turned up until it smoked and then turned back until it burned clean. EV levels are logarithmic, thus a change of ± 1 EV is twice or half as much light. So, the San Rival put out 3.75 - 2.88 = 0.87 EV more light = 1.8X as much light as the standard chimney was capable of. So almost twice! Disclaimer - none of this was precise science! I just tried to equalize the conditions and photographic angle for the comparisons. 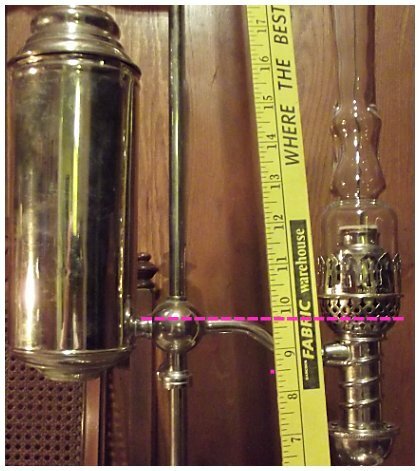 *Some Miller Student lamps DID NOT use either the standard 1 7/8'' chimney OR a #0C circular wick of 1 1/4'' diameter. 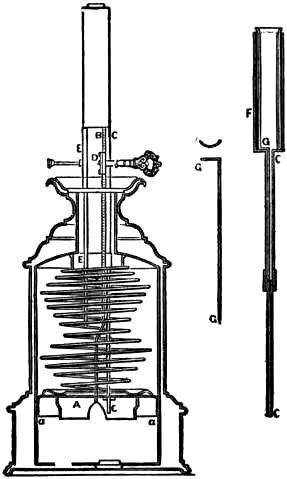 The Miller Syphon Student lamp patent dates of 1868 through 1878, pre-dating flame spreaders and Miller's center draft lamps. 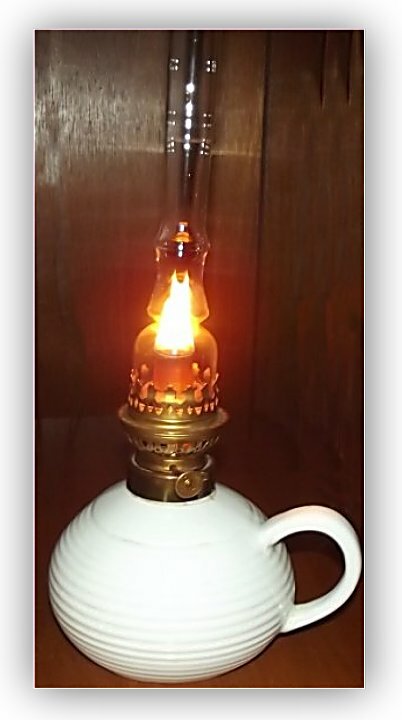 Photo: Mark Miller Miller Syphon Student Lamp showing the burner. This lamp uses very thick 15/16'' wide wicks. 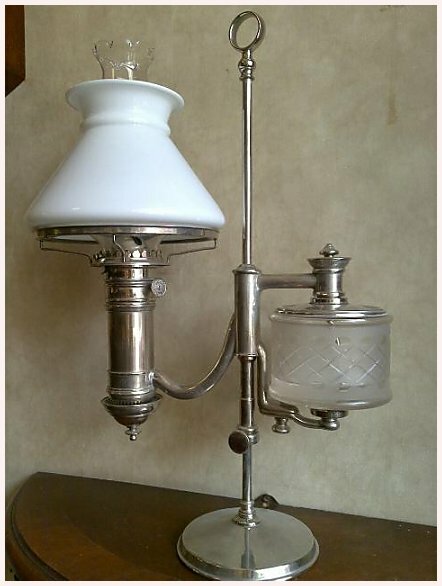 Exceedingly rare lamp! Miller #1 "Ideal" Student Lamp, photo courtesy of Edward Miller Lamp Co. 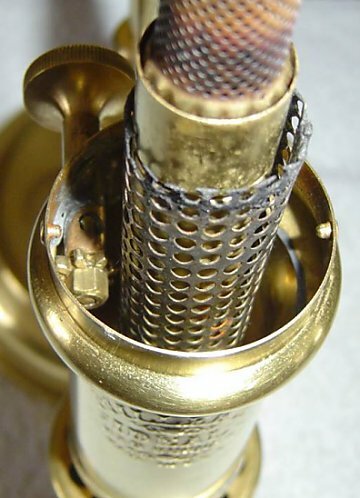 Above right, the unique burner on the Miller "Ideal" Student Lamp. Credit at left. Parts for student lamps often go missing or are damaged over the years. 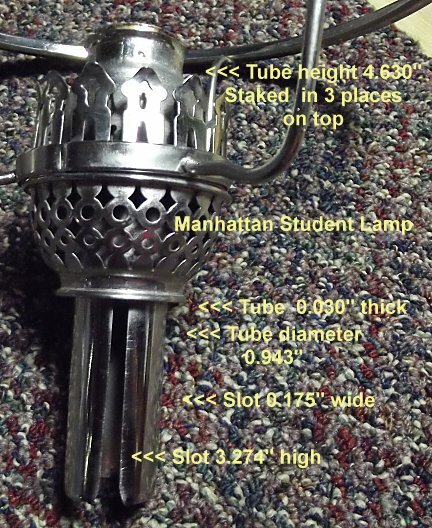 The photos above show dimensional data for a Manhattan Student Lamp burner.